The Mariinsky Theatre Orchestra is giving a concert on Thursday on the stage of Palmyra's world-famous amphitheater. Currently, Russian orchestra, conducted by the theater's Artistic and General Director Valery Gergiev, is holding a "Pray for Palmyra. Music Revives Ancient Ruins" concert on the stage of Palmyra's historic amphitheater. According to Syrian Culture Minister Issam Khalil, the concert of the Russian world-renowned Mariinsky Theatre Symphony Orchestra in the Syrian city of Palmyra is dedicated to the upcoming Victory Day. Russian President Vladimir Putin said on Thursday during an address with Syria's city of Palmyra, liberated from Daesh terrorists, that the concert of Russia's Mariinsky Theatre Symphony Orchestra in the historic city is a gratitude to everyone fighting against terrorism. "Thank you for this wonderful humanitarian action — the concert in Palmyra, liberated from terrorists. I consider it as an expression of gratitude, memory and hope. The gratitude to everyone, who fights against terrorism without sparing their own lives. The memory of all the victims of terror regardless of the place and time when crimes against humanity have been committed," Putin told the artists, scientists and the citizens of Palmyra during his address. He added that any success in anti-terror fight should be considered as a mutual victory, adding that it would contribute to the victory over terrorism. 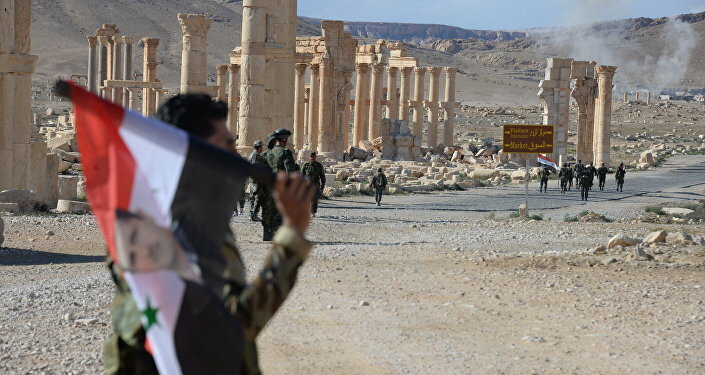 The Syrian armed forces, backed by militias and the Russian Aerospace Forces, recaptured Palmyra from Daesh on March 27, nearly a year after terrorists had taken hold of the city and destroyed much of the UNESCO World Heritage Site's artifacts. According to preliminary estimates, some 20 percent of ancient Palmyra was destroyed, while many exhibits were looted from museums. It could take around five years to restore the city.